Few things are more exciting than seeing someone's face light up on his or her special day when catching a glimpse of the perfect celebration cake. That's why at Confectionery Elegance everything is handmade from raw ingredients, so not only is your cake a stunning centerpiece, but it tastes wonderful as well. Too often have I seen beautiful wedding cakes that are cut open to reveal dry, flavorless layers. So, in an effort to remedy this, I created Confectionery Elegance. I attended culinary school in California where I was trained in classical Baking and Pastry work. During this time I was also an instructor for Wilton Enterprises, an industry leader in cake decorating. Since my graduation I have worked as a pastry chef in fine dining restaurants across the country. 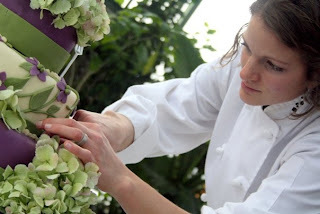 Whatever your dreams of the perfect wedding or special occasion cake include, I would be privileged to work with you in creating your own masterpiece.